Note the full colour decor, no decals and uniformity of templates. 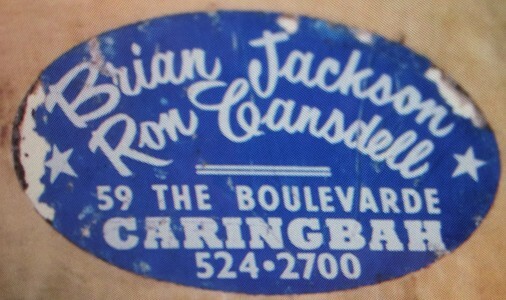 Skipp was also the Wollongong agent, 18 Corrimal Street Wollongong. Decal courtesy of Snazzy, February 2019. Photograph courtesy of Paul Flack. Volume 4 Number 1 page 32. 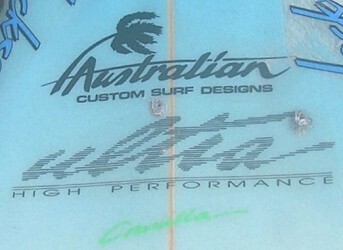 Markings noted: "Shaped and designed for alan by -JAI GURU DEV-"
1973 Spoon Knee Board 5 ft 5"
1990 Mini Mal 7ft 10". Volume 1 Number 5 page 32. 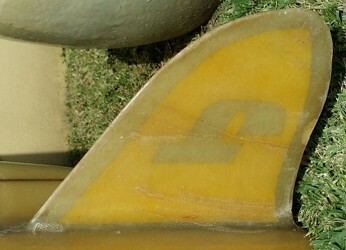 Right: Hooktail and D fin, 1964. Photographs courtesy of Paul Flack. 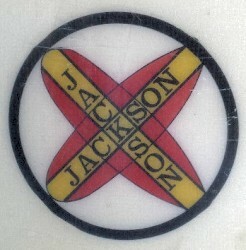 Jackson- Crossed Boards , circa 1967. 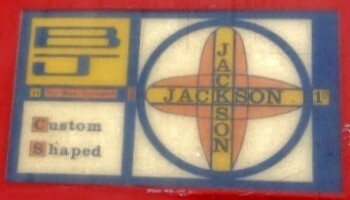 BJ Surfboards, Custom Shaped , circa 1967. 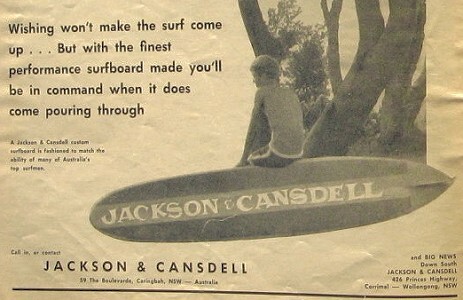 Jackson Surfboards, Caringbah, circa 1979. 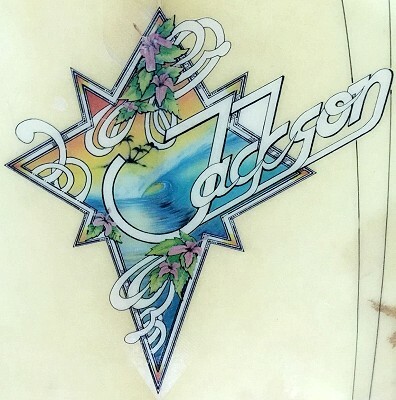 Jackson: Customline Kneeboards by Rob McLaggan, circa 1979. 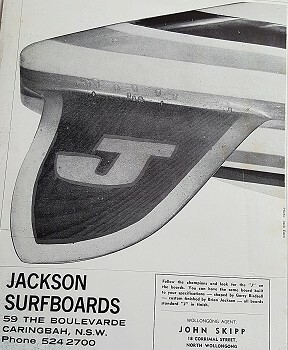 The Board by Jackson, 1978. 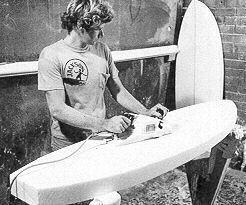 Right: Laurie Byrne shaping at Jackson Surfboards, circa 1970.
,Margan and Finney: Pictorial History of Surfing (1970), page 198. 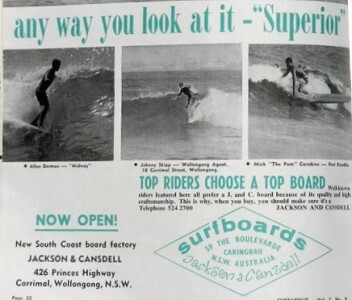 Wollongong NSW, where he shaped boards for Tom Carroll. All boards have been restored, some extensively, except where noted. All dates and dimensions are my estimations. 16 ft hollow timber framed and dark plywood shell. 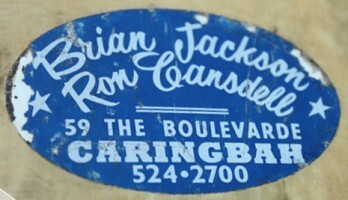 Metal handle, metal bung, hand painted script ‘Jackson’. 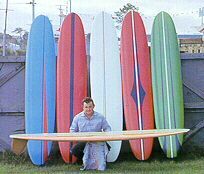 Not made by Brian Jackson but similar model to the board he first surfed.
. Rounded square nose, 5 inch square tail. Metal tail bung, hand painted script ‘Jackson’.
. Metal nose bung, nails showing, hand painted script ‘Jackson’. 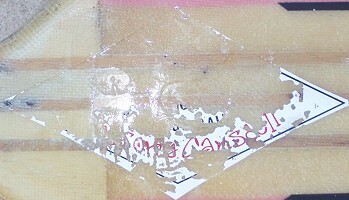 7 inch Velzy-Jacobs timber fin. 9 ft 3 inch hollow timber famed and dark colour multi panel plywood shell. Rounded square nose, 5 inch square tail. 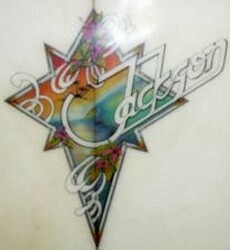 Metal nose bung, hand painted script ‘Jackson’ and 1960-1961 red and white surf permit sticker on nose. 5 inch rounded keel timber fin. 8 ft 6 inch block balsa wood and fibreglass. Semi pin nose, rounded pin tail. 8 ft 4 inch block balsa wood and fibreglass. 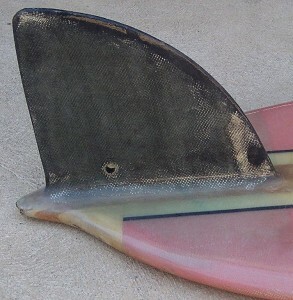 Semi pin nose, rounded pintail. 9 ft 2 inch balsa with I inch and 2 x ½ inch red wood stringers. 9 ft 2 inch foam. 1 inch Balsa and 2 x ½ inch redwood stringers. 9 ft 4 inch foam. 2 inch redwood stringer with nose and tail block. 7 ft 3 inch stringerless foam. Round nose, 10 inch diamond tail with unusual reverse chamfer. 8 ft stringerless foam in yellow Volan laminate. Round nose, rounded pin tail. 10 inch Greenough stage 3 fin. 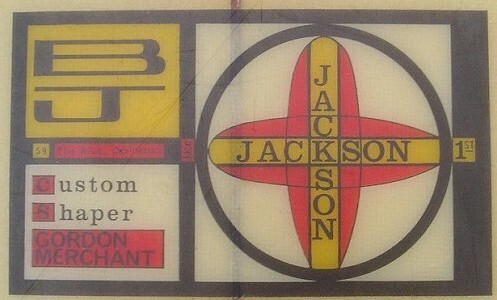 Geoff Cater (1999-2019) : Catalogue : Manufacturer - Jackson.